Leaf Shield Gutter Guard is the ultimate fire protection from bush fire ember attack. 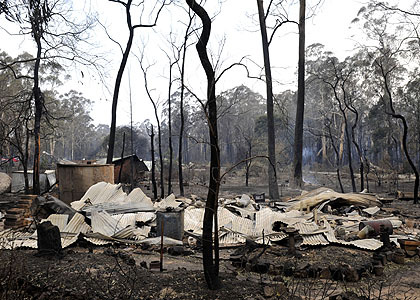 Houses and buildings located in and around bushland areas are at serious risk from bush fires. Home owners are well aware of the maintenance required to keep gutters clear of debris during peak fire season. Do I need to maintain Leaf Shield? No!!! That’s the best part – the Leafshield system is self cleaning in most situations. It’s rugged polyethylene construction means that it will not rust or cause electrolysis (oxidisation) and is therefore maintenance free. Leaf Shield gutter guards will provide protection for buildings from the threat of bush fire embers starting a fire in your roof gutters. Leaf Shield, Gutter Protection is 100% Australian made and owned with the mesh manufactured by Tapex Pty. Ltd. a wholly Australian owned and operated company. Leaf Shield provides a 10 year manufacturers and installation warranty. Diamond Aluminium Mesh is a zero fire rated mesh. Made available to comply with some council fire requirements. For those in bush fire areas and where councils specify an appropriate gutter guard our Diamond Aluminium guttermesh is definitely the right choice . It has a flammability index of 0 from the CSIRO making it the best protection available in bush fire prone areas the hole size is 3mm x 3mm and is suitable for guarding against most leaves except jacarandas and fine pine needles.